A back story is the information that reporters are supposed to gather to help the public gain a fuller understanding of the people involved. For example, a properly told back story of the armed carjacking last fall of Richard Angelico should help explain why the retired investigative reporter places a higher value on the recovery of his “disarmed” Civil War artillery shells and rifle barrels than on the return of his stolen F-150 truck. By early April, two of four juvenile suspects were under arrest and facing armed robbery charges in adult court. One boy is booked with two additional holdups; he turns 15 at the end of May. All of Angelico’s missing relics were dug from behind Confederate lines at Port Hudson, Louisiana, a strategic Rebel fortress upriver from New Orleans on the Mississippi River. A $1,000 reward for the return of the relics saw no takers. Angelico says he has scoured junkyards, streets and canals for the battlefield treasures with no result. Ironically, Angelico’s solitary search for battlefield treasures from Port Hudson has gone unnoticed in New Orleans, amid hot debate over the city’s plan to remove three statues honoring Confederate leaders and a fourth monument to rebellious white supremacists during the Reconstruction Era. Battle historians such as Edward Cunningham, author of The Port Hudson Campaign, 1862-1863, (LSU Press, 1991) have emphasized the seven-month Union siege of Port Hudson was the longest in U.S. military history. The greatly outnumbered rebels held off the Yankees, surrendering only after Confederate troops gave up after the Union siege of Vicksburg, Mississippi. 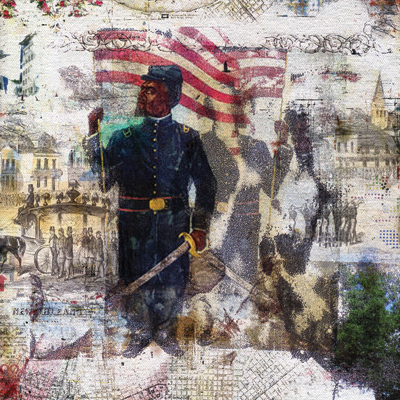 On the morning of May 27, 1863, two all-black Union regiments mustered from New Orleans charged Fort Hudson six times, suffering heavy casualties. Captain Andre Callioux, a former slave and a leader of the free black population in New Orleans before the Civil War, led a company of black troops from the Louisiana Native Guards across open ground in the historic assault on the Confederate stronghold. Callioux, 38, was hit in his left arm but kept moving. He exhorted his fellow troops, both slaves and free men of color, until he was fatally struck in the head. The bravery of the black troops at Port Hudson predated the charge of the 54th Massachusetts in South Carolina, which is celebrated in the movie Glory. “Callioux’s funeral, with full military honors, served as a black Unionist counterpoint to an earlier public tribute to Lt. Colonel Charles Didier Dreux, the first rebel Louisiana officer killed in the war,” Ochs writes. A raised bust of Colonel Dreux is found near the intersection of Canal Street and Jefferson Davis Parkway, the street named for the president of the confederacy. There is no conspicuous monument to Callioux in New Orleans. Captain Callioux became a national hero in the 1864 campaign to support ratification of the 13th Amendment banning slavery. Frankly, this writer had not heard of Callioux or the historic role of black troops at Port Hudson, until Angelico’s carjacking. The “victim” provided a seminal link to the Corps d’Afrique (1862-1863) from the website BlackPast.org. Angelico is best known for his 40-year career as a TV investigative reporter. He reported on more than 100 stories that resulted in criminal indictments, from corrupt politicians to internet-based child molesters. Today, “I am a student of the War of 1812 and the Civil War, with a special interest in locating artifacts from those two conflicts,” Angelico said in a recent email. It is a passion that began as a hobby in the 1970s, he says, on days off from news assignments. His Civil War relics became a casualty of New Orleans crime on the night of Sept. 14. Acting on a citizen tip, cops found the truck – but not the artifacts. “I don’t care about the truck,” Angelico reiterates. His frustration is easier to understand once you’ve heard the back story, including a significant but forgotten battle in 1863.